Where do rum balls come from? Proust is boring, but his cakes are memorable. The cake triggers an avalanche of memories—of childhood afternoons at his aunt’s house in the country and much else. My Proustian moment was round and chocolate sprinkled. A sudden flashback of my mother standing outside a bakery in Potters Bar looking for something she’d never find. Something continental among the rock buns, and sponges bright yellow like their distant bath-time cousins. The rum ball, as its common British name of ‘rum truffle’ suggests, is a small cake that leans towards the chocolate box. They’re a truffle-like confection made from leftover cake, sometimes with a few stale biscuits thrown into the mix, which is crumbled up with melted dark chocolate and rum, rolled into balls, and coated with sprinkles or cocoa. 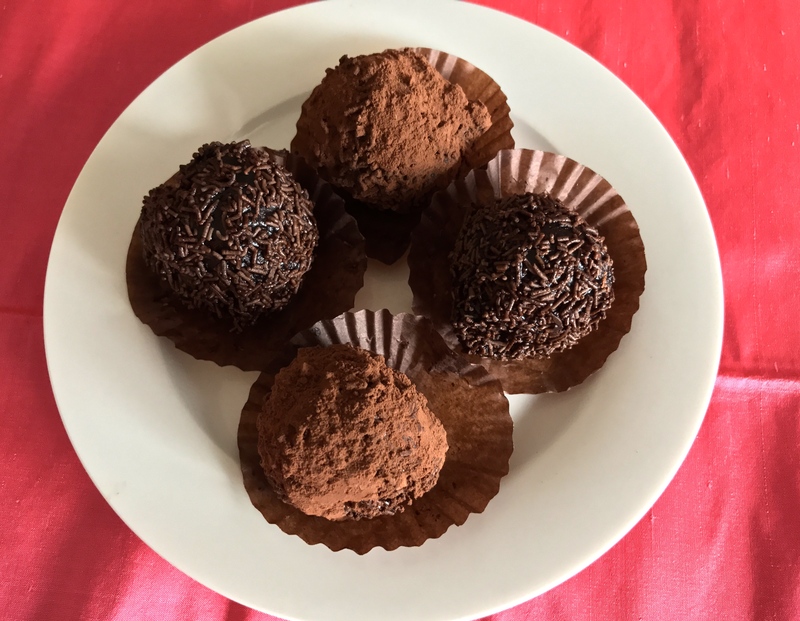 On my list of favourite spherical foods rum balls are in the top bracket—provided they have the requisite rich, boozy flavour, fudgy texture and aren’t too sweet. Some recipes include dried fruit, glacé cherries or ground nuts. Some eschew the rum to make a suitable-for-children adaptation. Although to my mind, a rum ball without the rum is—well, not a rum ball. Because they aren’t baked, the alcoholic kick remains. To my nine-year-old self, rum balls were part of the grown-up taste-sphere, along with liqueur chocolates and prawn cocktails. That was their primary appeal. One rainy morning decades later, I’m eating a rum ball in a Pyrmont café. Remembering not only my mother gazing wistfully into that bakery window, but also Flury’s, Kolkata’s iconic tea-room—scene of another rum ball indulgence. Pondering the cake’s heritage and wondering where it sits in the Australian culinary landscape. Somewhere between the madeiras and shortbreads of England and the tortes of central Europe, perhaps? Rum balls may be popular in Britain, but they’re also traditional fare in Germany, Austria, Slovenia, Hungary, the Czech Republic, and elsewhere. Were they an ingredient in Australia’s continental shift? Think post-war delis, coffee lounges, pâtisserie and cookbooks featuring stroganoff, schnitzels, strudels and black forest gateau. What did that word ‘continental’ represent? Sophistication and worldliness? A generalised notion of Europe? Was it a way of acknowledging cultural difference? A more palatable view of migrants? A few chocolate sprinkles are all that’s left of my Pyrmont rum ball; my Proustian reverie winds up. I’m pretty sure the Flury’s offering had rum flavouring rather than actual rum, but the ones my mother bought that day from the Potters Bar bakery did have real rum in them. I remember the sales assistant laughing as she explained that no one would get drunk eating them. I remember her voice with its trace of accent—like the presence of a flavour you almost but can’t quite identify. All work on Eat The Table is copyright Noëlle Janaczewska, 2013, 2014, 2015, 2016, 2017, 2018, 2019.